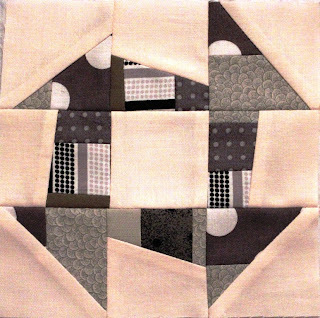 still undecided on my quilt for the doll quilt swap - I'm thinking liberated churn dash blocks but I still like the idea of flying geese as well ! I did one churn dash block on the weekend - my partner likes grey so I thought I'd use grey with a touch of pink for a soft look. I didn't get much sewing done this weekend as we had our race day on Saturday which is a big event in the town's social calendar !! Your churn blocks look very cute. Hope you get your curved piecing sorted! Love the wonky churn dash - almost a wonky house itself! You are nearly there on the houses - keep going! Look forward to receiving one from you Leanne!